Why Should I Hire Graduates of an Accredited Program? It puts a stamp of approval on graduates: Graduating from an accredited program indicates that graduates are ready to practice at a certain level. It provides educational programs with opportunities for self-definition and self-reflection, and with feedback on program content and direction. It affords the opportunity for continuous improvement of educational programs. Employers seek efficiency in the process of hiring and in training new employees. Often they find that by restricting hiring to graduates of accredited programs, they are able to recruit higher-quality employees than by allowing applicants from all programs to be interviewed and tested on the job. This is especially true especially in new labor markets where the corporation does not have sufficient experience with graduates of various academic programs. 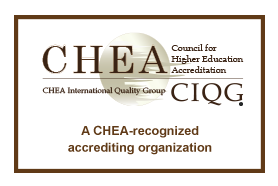 Accreditation protects the interests of students, their parents, the academic institutions themselves, and potential employers, by ensuring that the educational programs offered have attained a level that meets or exceeds standards that were developed by experts in the field. While accreditation does not ensure that every graduating student will become a successful professional, it does guarantee that the student has demonstrated a certain set of skills and abilities that are reflected in the accreditation criteria. It is not a sufficient condition for professional success, but in most disciplines it serves as a necessary condition.